Cavity Prevention – Studies have indicated that wasabi can suppresses bacterial growth in the mouth which aids in halting cavities from forming. The chemical compound found in wasabi known as isothiocyanates prevent sugar from sticking to your teeth. Decontamination – Wasabi has natural antibacterial properties which lead to fighting E. coli and other unwanted bacterial infection. This natural bacterial deterrent is in fact why wasabi is so commonly eaten with sushi, as it protects from any bacteria present in the raw fish. Anti-Inflammatory – When ingested, wasabi acts as an anti-inflammatory agent. It fights against platelet aggregation which is the cause of arthritic pain and joint swelling. 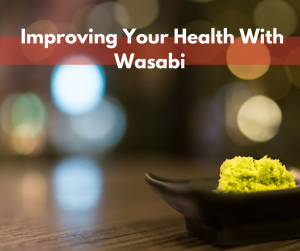 Fighting Cancer – Containing those ever resourceful isothiocyanates, wasabi promotes healthier liver function and blocks enzymes which could lead to pre-carcinogenic compounds. By preventing these harmful enzymes, the risk of developing cancer decreases. While the intense spicy flavor might be too much for some, there are far too many benefits to ignore. Wasabi goes great with sushi, and even better with your body, so be sure to enjoy some on your next visit to Shogun Japanese Steakhouse. For an authentic experience, book your reservations today at 407-352-1607.